Anyway, when I logged into my account, I saw a bunch of photos we printed for my grandma's birthday party a couple years ago, all black and white, from various stages of her youth. 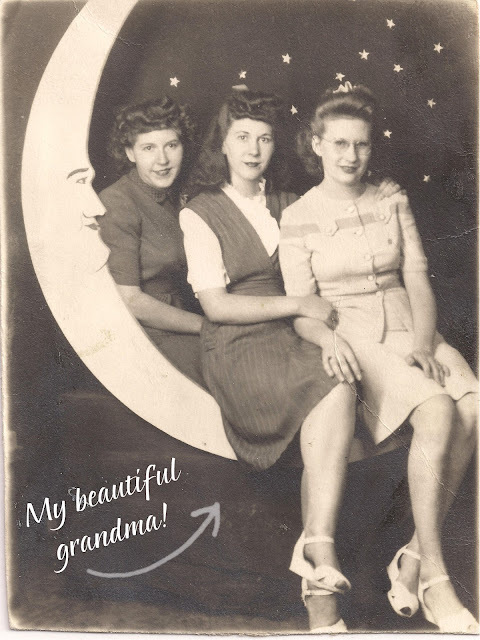 One of my favorites is her, her sister and one of their friends sitting for a "Man on the Moon" photo (pictured above), a sort of iconic setting I've seen a lot when looking at old photos. But it got my wheels turning...how did this photo fad start? "What I find really interesting about them is that they seem to have been a real departure from the formal studio portraits of the late nineteenth century. The portraits were cheap enough so that anybody could afford to have one taken. Besides studios, more informal "Man in the Moon" portrait booths could be found at arcades, carnivals and county fairs. 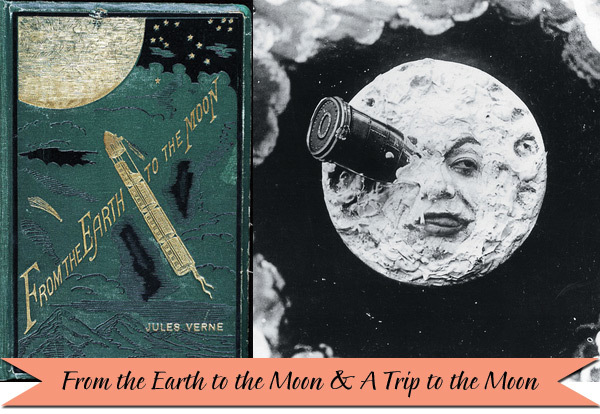 Many of the people posing on the paper moons were obviously having a good time -- smiling and sometimes cavorting for the camera -- something that was almost never done in studio portraits of the day." Another commenter has a theory that since these moon portraits were popular around the same time as the popular 1902 French black-and-white film A Trip to the Moon (which he/she said was influenced by the 1865 Jules Verne novel From the Earth to the Moon), that those two pop culture happenings might have had some influence as to how this backdrop ever came about. Seems pretty possible to me! Do any of you have any family photos with this kind of backdrop? Or seen that movie? Or read that book? I'm kind of compelled to do a little reading and watching myself!